Whether you are looking for something sweet or savory, for a birthday or holiday, Hickory Farms has a gift basket or box to fit your needs. Chances are you’ve heard of award-winning, Hickory Farms. What you might not know, is that this wonderful gourmet gift company was started in 1951 out of a small Ohio farm, specializing in fine cheeses. Since then, Hickory Farms has grown and expanded to offer a lovely selection of gourmet food gifts and baskets—perfect for every occasion. A gourmet food vendor, enhancing family traditions and special occasions with their collection of food gifts and assortments. 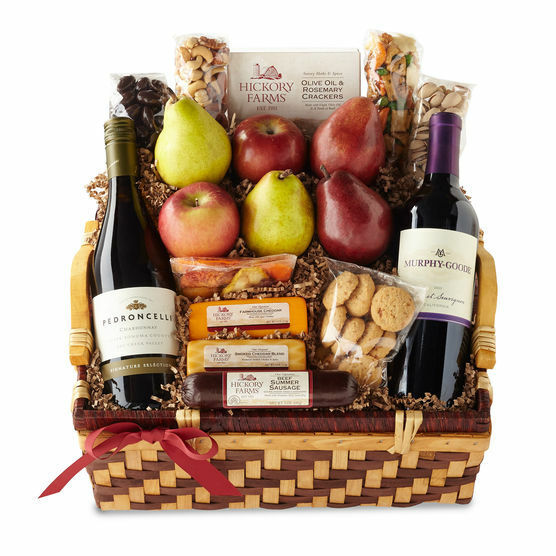 This company offers a wide selections of gift baskets and assortments, including their well-known sausage and cheese sets, as well as fruit and nut assortments, wine gifts, sweets and specialty foods. They carry a nice selection of gifts baskets, boxes and towers for Christmas and Thanksgiving, and also allow many of their gifts to be personalized for special occasions. Almost all of Hickory Farms’ assortments contain products from their own company. Whether it is their signature chocolate collection, farm stand fruit spreads or fresh baked treats—they make it all. One exception to this rule is their assortment of fine wines from companies like Handley, Dry Creek, Hahn and Lucinda & Mille. They also carry specialty steaks and seafood from Pfaelzer Brothers. They do not offer any non-edible gift baskets like spa or pet themed assortments at this time. Hickory Farms does not have any build-your-own gift basket options; however, with their wide selection of options, we do not foresee this being an issue for anyone. Although they do not allow customers to create their own, they do have a nice personalization feature, which lets customers customize the gift with a message as well as a ribbon for a variety of occasions including: thank you, happy birthday, get well and with sympathy. Like most gourmet gift vendors, Hickory Farms does offer seasonally-themed gift baskets, like their current Thanksgiving and Christmas gift assortments. As discussed previously, they also allow customers to customize any of their gifts with a gift note and ribbon for occasions including birthday, congratulations, sympathy and more. Hickory Farms also has a section of gourmet, gluten-free gift baskets and sets—perfect for anyone you know with dietary restrictions. They unfortunately do not carry Kosher, vegan or sugar-free gift options at this time. Bulk discounts, personalization options and a personal business gift consultant, are just a few of Hickory Farms business gifting services. Their consultant, specializing in corporate gifting can help corporate buyers find exactly what they are looking for based on price or other factors. Gift baskets and packaging can both be branded with a company logo, and customized ribbons can be included as well. Even better, they offer bulk discounts for orders over $500, detailed on their website. They also allow corporate shoppers to send multiple gift baskets and fine food assortments at once and create a corporate profile for faster ordering in the future. Hickory Farms has a nice selection of gift options at every price point, and their easy-to-use website allows customers to conveniently shop by price range. This is ideal for those shopping on a budget. They also have a variety of gift options for under $20, including chocolate assortments, meat and cheese boxes, arrangements of fruit spreads and a fun, festive package of snowflake pretzels. The majority of their gifts fall between $30 and $50 dollars, making them very reasonably priced compared to many other gift basket vendors. Some of the assortments in this price range include their holiday petits fours, a reserve cheese flight and their Here’s to the Holidays gift box, brimming with their signature meats and cheeses and a bottle of Lucinda & Mille wine. 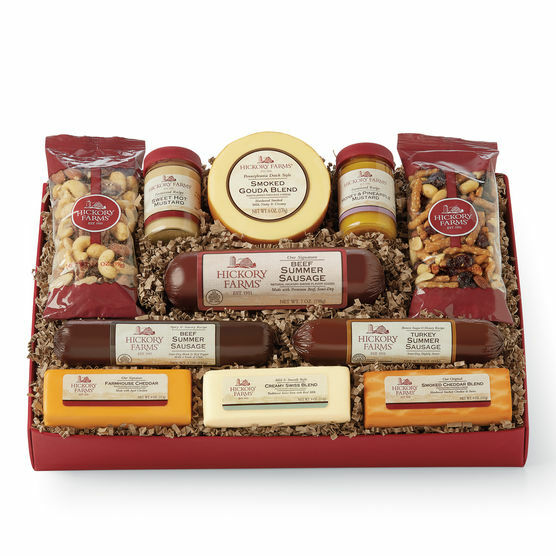 Hickory Farms also offers more decadent assortments between $50 and $200. These larger baskets contain a wider selection of their gourmet goods, like their Winter Wonderland basket, overflowing with cheeses, sausages, crackers, sweets and wines from Parducci. Although their website is not Google-verified, you can shop securely on their website and make purchases with all major credit cards as well as PayPal. All purchases can be shipped by standard 3-7 day, 2-day or overnight. Within the contiguous United States standard shipping is $10.00, while 2-day shipping is $25 and overnight is $35. All fresh fruit, honey gold hams and Hickory Farms reserve items ship for a flat rate of $10. Shipment to Alaska and Hawaii is available for $32 (2-day) and $42 (overnight). Hickory Farms also ships to Canada for $35 and to P.O. Boxes in Guam, U.S. Virgin Islands and Puerto Rico for a flat rate of $10.00. In order to honor those in the military Hickory Farms ships free to all APO/FPO military addresses. This only applies to denoted items, as not all assortments are available to ship overseas. Wine orders through Wine.com from Hickory Farms cannot be shipped to P.O. Boxes that are outside of the United States and also cannot be sent to P.O. boxes to: GA, IN, IA, KY, ME, MS, MT, OK or UT. Wine gifts directly from Hickory Farms also cannot be shipped to international P.O. Boxes, or to P.O. Boxes in: AL, AR, DE, FL, IL, KY, MA, MS, MT, NJ, NY, NC, OK, PA, RI, SC, SD, TX, UT or VT.
Hickory Farms also offers a 100% satisfaction guarantee, and takes whatever means necessary, depending on the items selected, to ensure your purchase arrives completely fresh and intact. 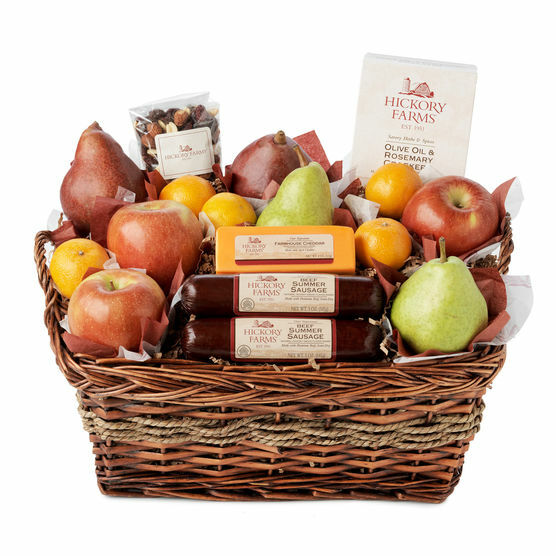 The gourmet gifts from Hickory Farms mostly come in either their signature red boxes, intricately-woven gift baskets or other attractive packaging. Their current Christmas and Thanksgiving assortment feature festive packaging, and as mentioned before, many of their gifts are eligible to be personalized with a gift message and a special occasion ribbon. Hickory Farms 100% satisfaction guarantee states that if you or the recipient of your gift are not completely happy with your purchase, they will replace, exchange or refund the purchase. Even better, the promise that their excellent customer service team with take care of the issue in a quick and courteous manner. Hickory Farms can be contacted conveniently by email through a form on their website. If you prefer to speak with a customer service representative by phone, their toll-free number can be reached Monday through Friday during business hours . Their user-friendly website also includes a thorough FAQ section which should help you with questions regarding shipping, holiday deadlines, order placement and more. Hickory Farms has been BBB-accredited for years , and have an A+ score. Under $50 – We were happy to see that Hickory Farms has a selection of gifts in this lower price range. Even better, they also have a solid variety of gifts for less than $20. Some of these lower-priced gift options include an assortment of wine cheese spreads, a sweet and salty nut sampler and a beef, turkey and cheese set. Their $20-$50 dollar options include specialty items, like their Tea Time Collection boxed set, baskets of assorted baked goods and their Hickory Fireset gift set which contains an assortment of meats and cheeses with a lovely bottle of Chardonnay from Lucinda & Mille. $50 to $100 – Gifts in this price range are similar to the sets and assortments under $50, only on a much larger scale—think multiple bottles of wine, instead of just one.Additionally, the items available for purchase in this price range include many of their gourmet meats, like their spiral cut ham and towers of their fresh fruit. $100 to $200 – Most of their fine steaks and seafoods from Pfaelzer Brothers fall into this price range, with premium cut steaks and Maryland-style crab cakes being a few of these decadent options. Some of their larger assortments, also fall into this price range. $200 and up – Hickory Farms does not have any items for purchase that are over $200. Similarly to the other vendors, Hickory Farms is ideal for anyone looking for a gift. Their wide range of reasonably priced gift basket options makes them an excellent choice for anyone on a budget, while business program with discounts, multiple customization options and a dedicated customer service team makes them a great gift destination for corporate clients. We like that Hickory Farms can customize most of their sets for different events with decorative ribbons and cards. We were also impressed by their corporate gifting program – offering all of the perks corporate buyers would expect when fulfilling their orders, thanking clients or even honoring employees. Another perk of this vendor is their wide range of prices, with many items below $50. Although Hickory Farms has a gluten-free section of gifts, we would have loved to see Kosher, vegan and sugar-free options too for a more well-rounded selection. Also, those looking for over-the-top expensive gifts may find this vendor limiting, since they do not offer any assortments that are more than $200. This Ohio-based vendor focuses on curating gourmet food gifts for holidays and special occasions. Hickory Farms wants to make every celebration better with their array of expertly-curated gift baskets, towers and sets—and they do just that. Their top-quality assortments of sweet and savory treats make the perfect gifts for just about every occasion. $50 to $100 – Gifts in this price range are similar to the sets and assortments under $50, only on a much larger scale—think multiple bottles of wine, instead of just one. Additionally, the items available for purchase in this price range include many of their gourmet meats, like their spiral cut ham and towers of their fresh fruit.